I’ve had dogs all my life, and I’ve tried a number of different dog diarrhea home remedies through the years. With my previous dogs, they would pretty much eat whatever I gave them to try — from a bland baked potato, to cooked rice, to scrambled eggs. Tenor had a bout with diarrhea yesterday, and I spent all morning trying to find the perfect combination of human foods that he would eat. Cooked white rice – no go. My dog wouldn’t touch it. Scrambled egg – nope. Not having that either. Canned pumpkin – ah hah! He was interested at first, but then no way. By noon, I was struggling to find a food that would help to bind him up and put an end to the diarrhea that he would actually eat. Finally, I remembered… chicken broth! Since I had all of this leftover cooked rice, scrambled eggs, and pumpkin spice stored in the refrigerator, I decided to try one last thing. I combined all of that with a little chicken broth — for my homemade dog diarrhea treatment. Oh, and I also added a few chunks of his all-time favorite kibble that I keep stored away for special occasions (like to put in his treat toys). For the rest of the day, he couldn’t get enough of that combination of diarrhea-curing foods. And by late evening, his diarrhea was completely gone. I’ve never been able to clear up a case of diarrhea in dogs that quickly before. Usually it takes overnight. Two days is typically the norm before I take my dog to the vet for a professional diagnosis and dog diarrhea treatment. For what it’s worth, pumpkin can have both a binding effect (good for dogs with diarrhea), as well as a loosening effect (good for dogs with constipation) — so as an at-home remedy, it works differently with different dogs at different times. 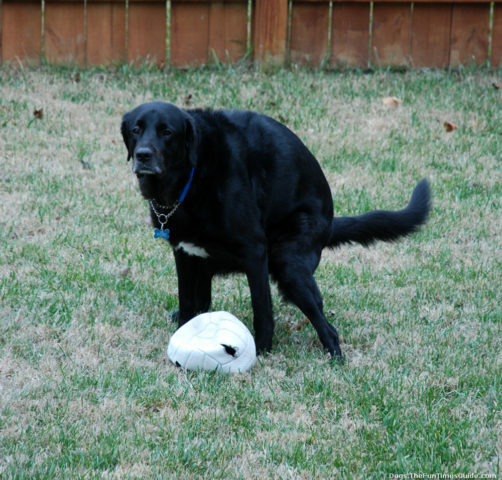 Must read: Vet or No Vet When Your Dog Has Diarrhea? Finally, (and this is a difficult one)… don’t let your dog outside to go to the bathroom too many times in a row. Only you will know what your dog’s signals for going outside are. And you should be able to tell when he really needs to go — as opposed to when he’s just uncomfortable and keeps thinking he has to go. Once you get to the point that straight liquid is coming out, I’ve found that it’s helpful if you can help those dog diarrhea home remedy foods do their work by letting them sit inside the dog’s tummy to “bind” for awhile. Otherwise, your dog will indeed keep squirting liquid, and you’re likely to have a dog with a sore behind in no time. Plus, the diarrhea will take longer to cure. That’s just what I’ve learned with my 3 dogs through the years. Everyone may not feel the same way on this, but even if you can get your dog to wait 5 extra minutes each time — that could make a difference in how quickly the diarrhea goes away. The idea is to play with your dog during this time and do things that take his mind off of having to go to the bathroom. Of course, this only applies when your dog is not having any difficulty keeping the diarrhea inside him. If your dog’s diarrhea is to the point that he’s messing in the house, then by all means, let your dog do whatever he has to do… outside!